Carnaby Cars are proud to be able to supply the full range of new Ssangyong and LDV quality vehicles. Carnaby Cars stock a large range of top quality low kilometred vehicles. We pride ourselves on our after sales service, that's why people keep coming back to us time after time. Being a market leader in vehicle sales in Gore Eastern Southland since 1977 doesn't happen by accident. Carnaby Cars started selling cars and commercials with a very small operation back in 1977 and have grown over the years to be a market leader in the field. The vehicle market has seen many changes over the years but probable none bigger than the importation of used Japanese vehicles. Carnaby Cars were one of the first to import vehicles direct from Japan these years of experience have proved invaluable today meaning we are able to find and import only the very best stock whether it is stock for the yard or a special order for a customer Carnaby Cars can source a high quality vehicle at the right price. 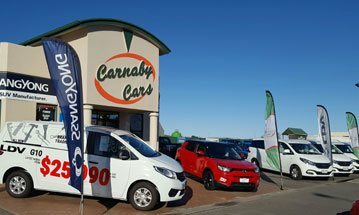 Operating from their large Main Street yard in Gore, Carnaby Cars are not only a supplier of quality used NZ New & Japanese Import Vehicles but have also held the Ssangyong & LDV New Vehicle Franchise for over 10 years. This is great news according to Managing Director Leslie Baxter - "We can offer the very latest range of vehicles from Ssangyong Korea's premium SUV manufacturer & LDV Commercial’s. Being able to supply the exciting new range of recreational vehicles that offers customers a new level of value with class leading performance comfort and safety with the full back up of Ssangyong & LDV New Zealand is great for our customers. We now have the field covered with something for everyone with our used vehicles priced from as low as $1,000 through to the top of the line new Ssangyong Rexton at $60,000.00 and everything in between." Being a successful business is not just about having the right vehicles at the right price the most important thing in any business are the staff and the service they provide. Having the right staff with the knowledge, experience and a genuine commitment to customer service means not only do we make purchasing your new vehicle a pleasurable experience we make sure you receive after sale service that is second to none. Carnaby Cars have been supplying the people of Eastern Southland quality vehicles and great service for over 30 years and a testament to this is the enormous amount of repeat business with customers who come back time after time for their vehicles. Thanks to good old fashioned honesty, integrity and reliability, Carnaby Cars will be here supplying great vehicles to great people for many years to come.